Is your new home broken? Chances are your new home will not be 100% perfect. The patio will be too small, a wall will be in the way, or the kitchen counter will be wood instead of marble… or marble instead of wood. You don’t have to settle on the first contractor you call. Shop around and see who has the best price. When getting a quote, make sure to establish what it entails. Does it cover materials? Time? And who bears the risk for unforeseen issues? If you call a couple local contractors and the quotes seem too high, try putting an ad out on Craigslist for a specific price and see if you get any responses. Also, ask your friends, neighbors, and community for recommendations. Often the cheapest hire will come to you by referral. 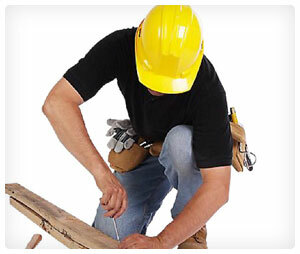 Take the time to interview and meet with each contractor you are considering. You want to make sure that you and the contractor get along well, as communication and cooperation are going to be key to successfully completing the job. Check out the contractor’s website, too, if he/she has one. Contractor – Check what permits and insurance are required in your area, then make sure your contractor can provide you with copies of his/her policies. You – If you are undertaking a large project, it’s a good idea to get homeowner’s insurance for that just-in-case scenario. Even if your contractor has all the right permits and insurance, you might want to insure yourself as well. Once you’ve found a contractor you want to work with, make sure you agree on a price and timeline for the project. Also, it’s a good idea to set up a payment timeline before the project is underway. In construction there can be a lot of surprising, hidden costs, so be sure to get all of the possible costs out in the open before the start of your project. Do all of this in writing. Hire a lawyer to draft the contract, if your project is really large and involves a lot of money and time. Many contractors will also ask for a certain portion of the finances up front to help start the project; this should be a previously agreed-upon amount. Another clause to include in your contract is the right to refuse payment until the job is finished. Withhold a portion of the total cost for the final payment, when the project is completed to your liking. Check here if you like your home’s structure but need some help decorating.